Some years ago, in the dark ages of Android, Motorola released a phone called the Atrix 4G. Moto created an accessory for that phone called the Lapdock, which was a laptop-like device powered by the phone. It was not a smashing success. They say those who do not learn from the past are doomed to repeat it, and apparently, Razer was not paying attention. At CES, it has unveiled Project Linda, a prototype laptop dock for the Razer Phone. It's bananas. I'm giving Razer a bit of a hard time here, but it's not actually looking to sell you this contraption like Moto was a few years back. Project Linda is still just a concept. The hardware looks at first like a Razer Blade ultrabook with its 13.3-inch QHD display and aluminum frame. However, there's no trackpad. That's where you dock the Razer Phone. It locks into place with a retractable Type-C plug, and powers the entire laptop as well as acting as the trackpad. The interface is Android with a custom theme to make it work better on a computer (similar to Huawei's projected mode on the Mate 10). So, you get your apps on a larger screen with a keyboard and mouse. And yes, the keyboard has Razer's fancy Chroma lighting effects. This is just a prototype, so developers haven't had a chance to customize apps. The demo shows off Vainglory with what appear to be menu customizations and minimap support on the phone. It's an interesting idea, but there's probably a reason this is only a concept. You'd need a lot of developer backing to make something like this worthwhile, and it wouldn't be cheap. It's a cool tech demo at the very least, and I wouldn't put it past Razer to try and sell something like this eventually. LAS VEGAS, Jan. 9, 2018 /PRNewswire/ -- (CES 2018) – Razer™, the leading lifestyle brand for gamers, today revealed "Project Linda," a 13.3-inch laptop design powered by the Android-based Razer Phone. 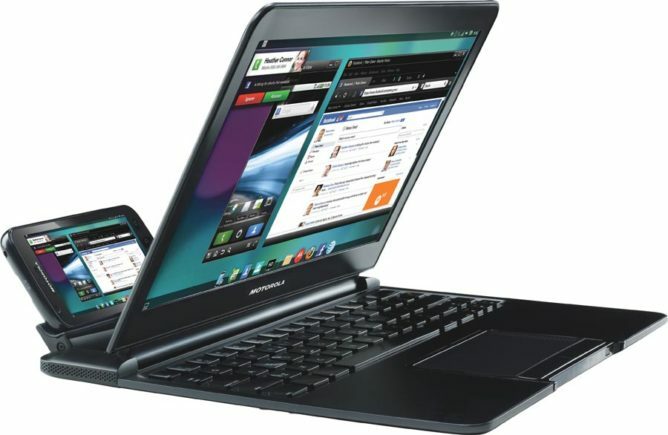 The smartphone and laptop hybrid concept harkens a new era for mobile personal computing, blending the familiar Android environment with the ease-of-use of a laptop. As one of the few companies in the world to straddle user interfaces, laptops and smartphones, Project Linda is a groundbreaking concept that blurs the lines between the smartphone and the laptop. Razer's Project Linda laptop seamlessly docks the Razer Phone inside its chassis where a touchpad would normally reside, and connects with the press of a button. The phone's Qualcomm® Snapdragon™ 835 mobile platform and 8 GB of RAM deliver responsive performance, instantly transforming Project Linda into an Android laptop. The Razer Phone 5.7-inch display can be used as a touchpad, or as a second screen for access to apps, tools, and more. 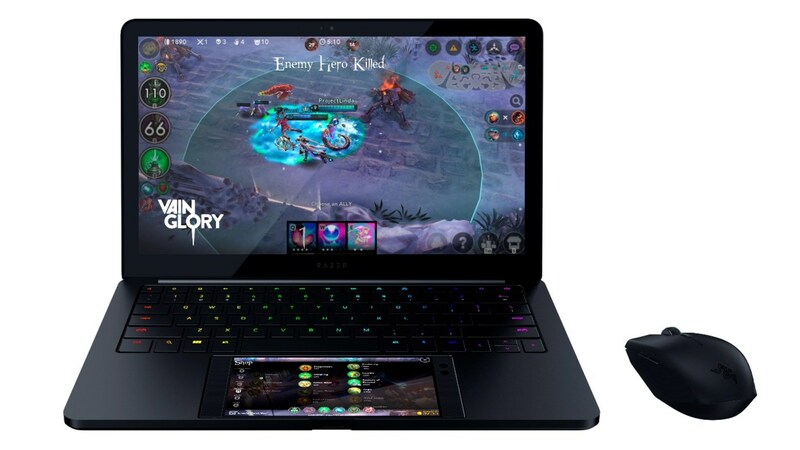 "Android power users and laptop enthusiasts share a need for performance in a mobile form factor, which we provide with our award-winning Razer Phone and Razer laptops," says Razer co-founder and CEO Min-Liang Tan. "Project Linda combines the best of both worlds, bringing a larger screen and physical keyboard to the Android environment, enhancing the experience for gaming and productivity." A full-size, built-in keyboard adds to the capabilities of Project Linda, providing enhanced productivity and differentiated gaming experiences. Users benefit from a responsive and comfortable typing experience, customized for the Android environment with dedicated keys for navigation, search and app selection. The Razer Chroma™ backlighting is ideal for low-light situations and can also be personalized with millions of color options. A user may complete the laptop input experience by using the docked phone as a touchpad, or a mouse may be connected for precision control in games and apps. Designed for mobility, the unibody CNC aluminum chassis of Razer Project Linda is just 0.59-inch (15 mm) thin and weighs under three pounds (1.25 kg) including the docked phone. Its 13.3-inch Quad HD touchscreen extends the 120 Hz experience available on the Razer Phone to a larger display, providing fluid motion and vibrant visuals. The concept also features a 53.6 Wh internal battery that can rapidly charge the docked phone to full capacity over three times while away from AC power. Inside the laptop is 200 GB of storage, allowing for offline backups and additional local media and app storage. Connectivity afforded via Project Linda includes a built in 3.5-millimeter audio jack, a USB-A port, a USB-C charging port, 720p webcam, and a dual-array microphone, giving a range of options for communication and external devices. Project Linda bridges the gap between handheld entertainment and laptop convenience. The Razer Phone's performance, display, and dual front-firing speakers combine seamlessly with Project Linda's larger screen, keyboard, and battery to provide the ultimate mobile hybrid setup for gaming, creativity, and productivity. Razer won official "Best of CES" awards an unprecedented seven years in a row, including innovations such as the Razer Switchblade (2012), the Razer Edge tablet (2013), Project Christine (2015), and the Razer Blade Stealth and Core (2016). More than 4,000 companies compete for accolades at CES, the world's most prestigious tech tradeshow. For more information on Razer's Project Linda concept and to register for announcements, visit razerzone.com/projectlinda.